Once search button is pressed, by default the first 25 products among totally found 140 are displayed in search result. This is due to the OData request sent with option $skip=0&$top=25, so only 25 records are fetched from backend. $inlinecount works like SELECT COUNT(*) in ABAP Open SQL to return the total number of matched records. another http request is sent automatically with option $skip=25&$top=25 to retrieve the records starting from index 26 to 50. 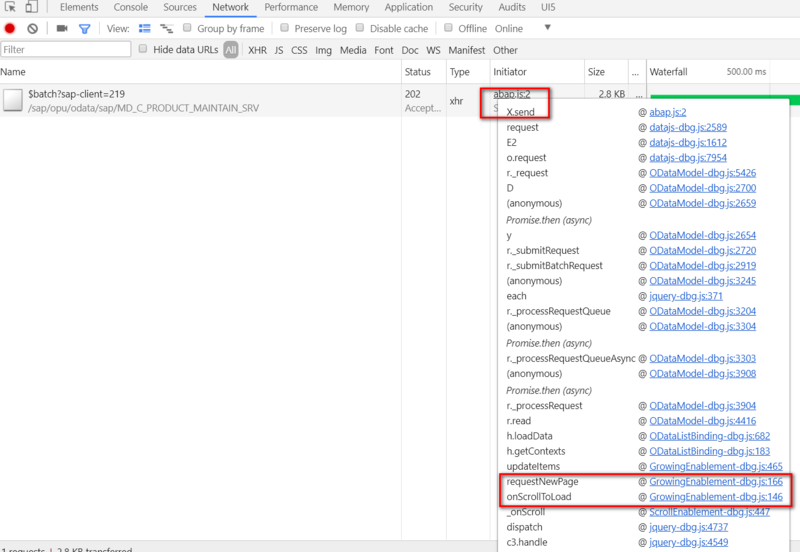 Hover mouse to abap.js which sends this http request, the callstack clearly shows that the scroll event will trigger the automatic load of the second batch of 25 products from backend. And go to GrowingEnablement.requestNewPage, there is a property _iLimit held internally and accumulated each time when “scroll to bottom and load more” event is fired. As this._oControl.getGrowingThreshold returns the constant value 25, so _iLimit looks like 0,25,50,75… and is used as parameter value for option $skip. Question from my colleague: growingThreshold is hard coded as 20 in sap.m.ListBase.js, why it becomes as 25 in the runtime? Well it takes me some time to find reason via debugging. As most of Fiori application in S/4HANA, Product Master application is also built on top of Smart Template. You could refer to my blog My understanding about how object page in Smart Template is rendered about how Smart Template works under the hood. 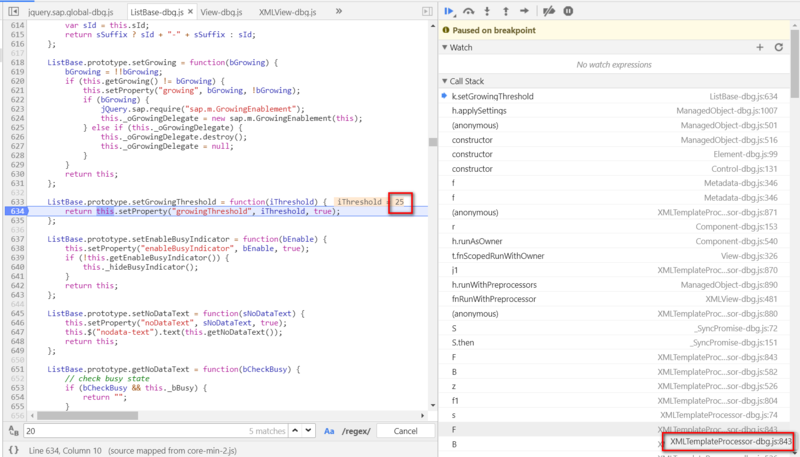 As mentioned in my blog, inside this ListReport.view.xml there are some view fragment declaraiton which points to other template file which will be loaded in company with ListReport.view.xml. 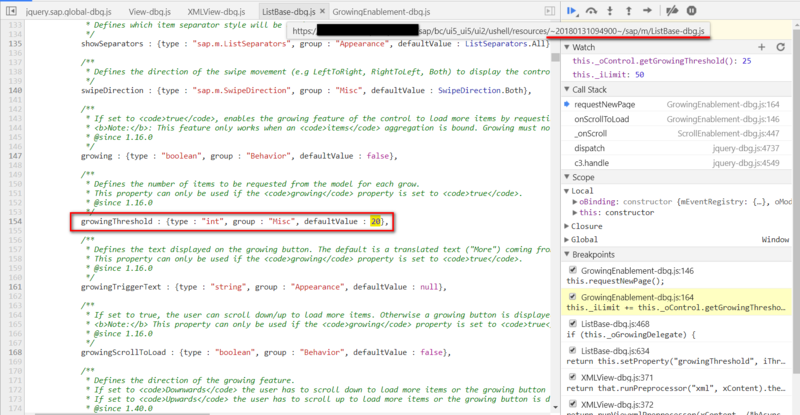 And growingThreshold is hardcoded in SmartTable.fragment.xml as 25. 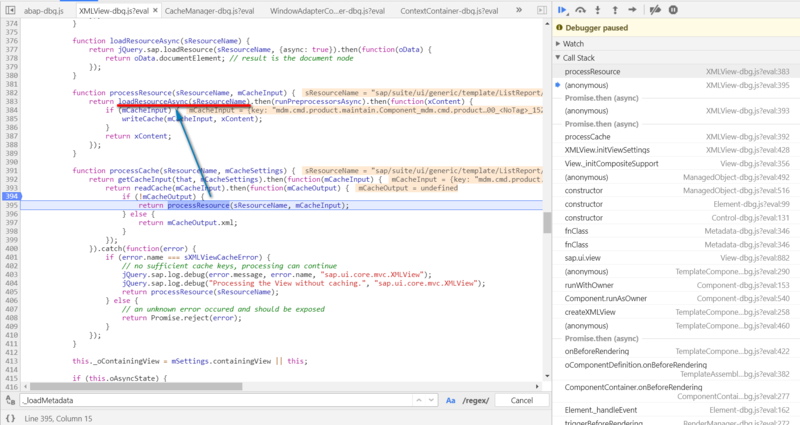 This fragment view is used to render search result as a table in Product Master Application. When SmartTable.fragment.xml is loaded and parsed, the growingThreshold is set as control property via setter API so that later it is returned by getter API in the “scroll to bottom and load more” scenario. If the application view to be rendered has already one entry in the cache, UI5 will NOT load Smart template related files from ABAP server any more( branch in line 428 ). 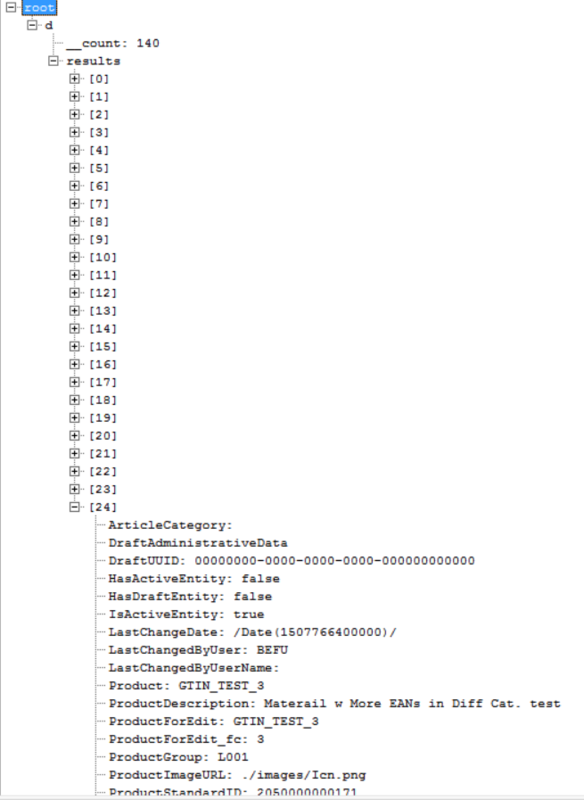 Via debugging I find out that the cache is managed by LRU algorithm using IndexedDB. 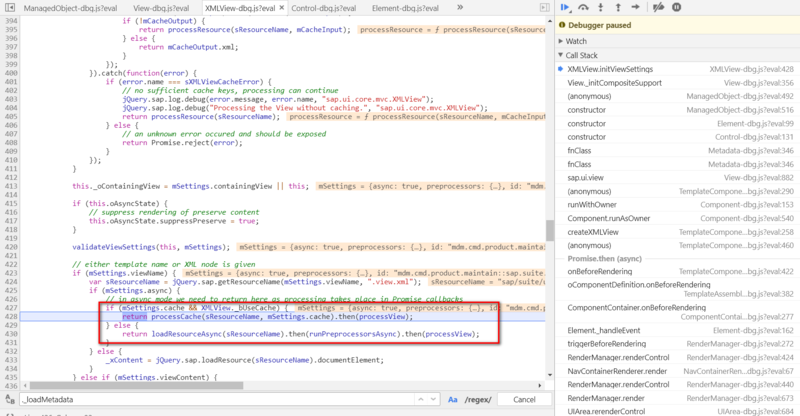 The whole merged xml source is already stored in IndexedDB, in this case you could never observe the Smart Template template files loading in Chrome development tool’s network tab. This will clean the cache and force the UI5 framework to reload template files from ABAP server. 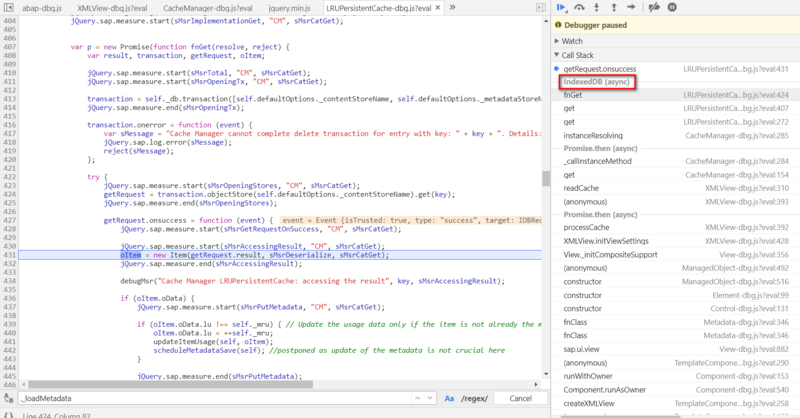 The knowledge introduced in this blog is a prerequisite to understand the search paging implementation in S/4HANA and CRM Fiori application. 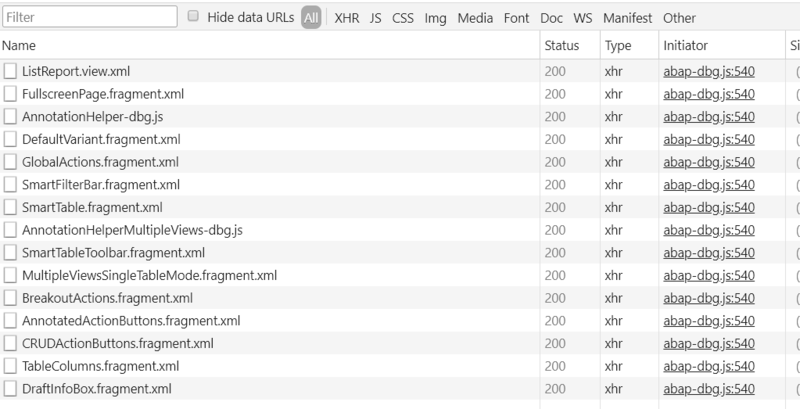 Just want to ask, if we don’t implement lazy loading with oData but read all data from backend to a JSON model and bind to responsive table with growing threshold = 25 will there be a difference in performance on the browser ?